Replacement:SEN-12011. We have a new rev of this breakout which fixes a few silkscreen issues, go check it out! This page is for reference only. 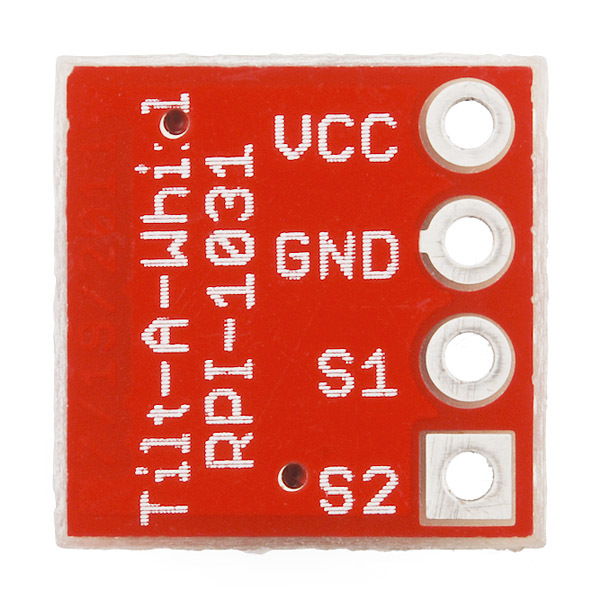 The RPI-1031 tilt sensor is capable of sensing a change in orientation in four different directions: forward, back, left or right. This breakout board makes it easier to incorporate the RPI-1031 in your next project by breaking the necessary pins out to standard 0.1" spaced headers. 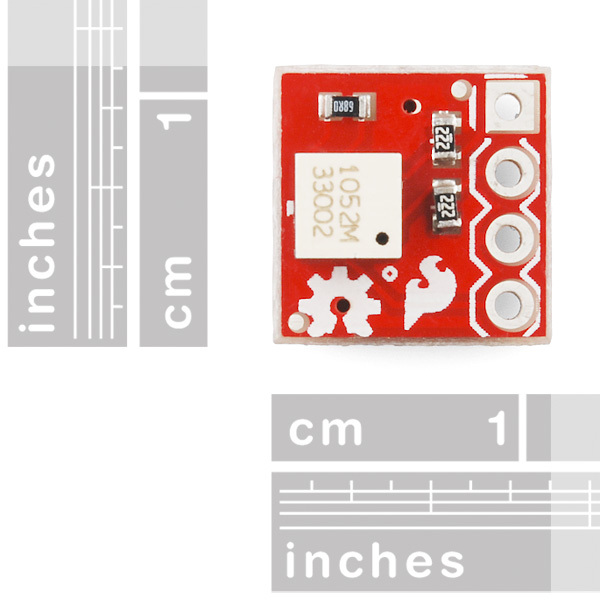 This board will work at either 3.3 or 5V. 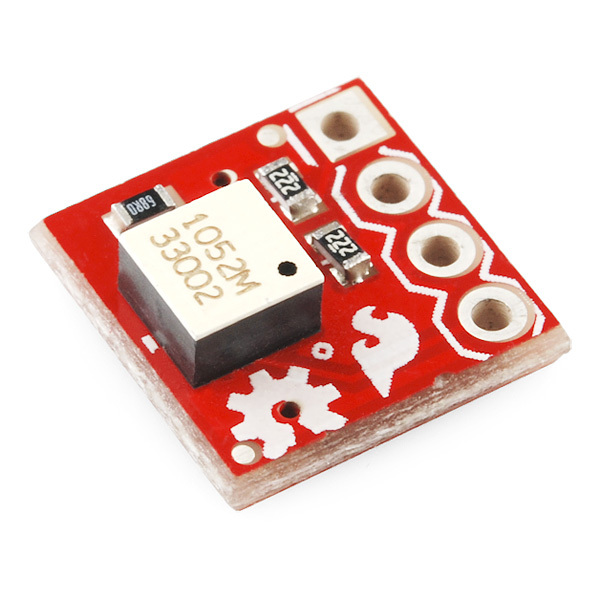 This board uses a LED input resistor value of 68 ohms; as a result the absolute maximum rating of the LED in the sensor will typically be exceeded when powering this board with 5V. A better value would be something like 390 Ohms (or 220 Ohms for 3.3V operation). At reduced LED current the load resistors (the 2.2K resistors) might need to be increased too (like maybe to 20K or so). This board should be able to work at any operating voltage from 3V to 5V and consume 10 mA or less with appropriate resistor values in place. 68R is definitely to little. BOB gets hot after 2 minutes of use! 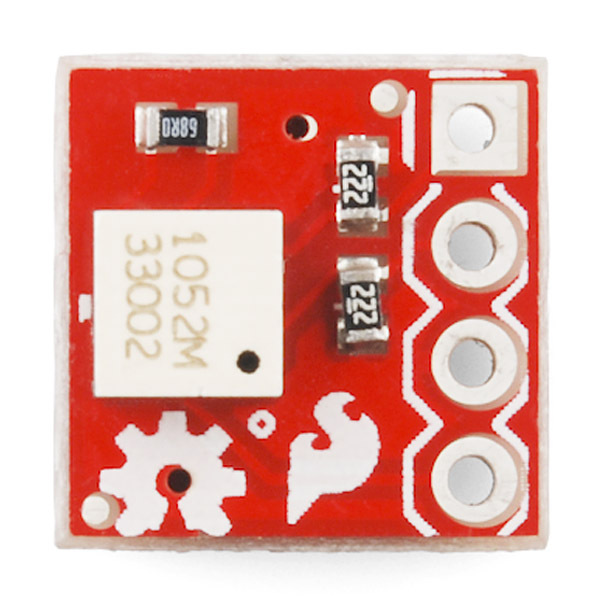 SparkFun, can you verify that 68R will not burn out/damage the LED? fix the code! It's so simple. Your error says "âgetTiltPosâ was not declared in this scope" this mean it does not exist, was not declared! Read the code and look, you ask for int position = getTiltPos(); This mean that there is a function call getTiltPos(); check your 17 lines of code and see if you can find getTiltPos()... no it's not there. That is why you get that error. Instead what you will you find is getTiltPosition()! This mean that you need to call that function instead. Your code will now be int position = getTiltPosition(); Now you will be able to get the Pirection of your Digital Steal Camera! these are some great tilt sensors! I had a couple of these to put on my own boards. A little too much time under the heat gun makes the top cover come off. The 'ball' is actually a small cylinder that can completely cover one of two detectors or the lone emitter. It cannot rotate along the perpendicular axis, as it is just as wide as the chamber it moves within. Anyone have some arduino code for this device they'd be willing to share? Tried the example code but always returned s1=0; switched s1 to pin 11 and problem solved (someone smarter than me can explain why). Mounted horizontally the sensor needs to tilt about 25 degrees before change of state. That silk is extremely offset. It shouldn't affect the durability or usability of the board much. For a sensor that detects tilt, one would expect some specification in the datasheet that indicates the amount of rotation before the output changes state. Unless I missed it, this important info was omitted. However, as Chris stated, we can be assured that the sensor can detect the Pirection of your Digital Steal Camera. It would seem that the suggested use is to mount the device perpendicular to your plane of interest, in this way it can tell which of its four sides are facing the ground... meaning that the state will change every 90 degrees about halfway between each side. because it's based on a photo-interrupter, you may find that the effective angle will depend on whether the sensor is stationary, after all it's essentially a ball rolling inside a square channel. I suspect that mounting it on the horizontal plane will result in a useless reading (ball just free-rolling) until you tilt it in one direction or another in which case you'll probably only need to deflect it by a few degrees.